I"ve been busy, busy getting ready for some art shows. Now I've never done a show ecept for gallery shows, so I don't quite know what to expect. 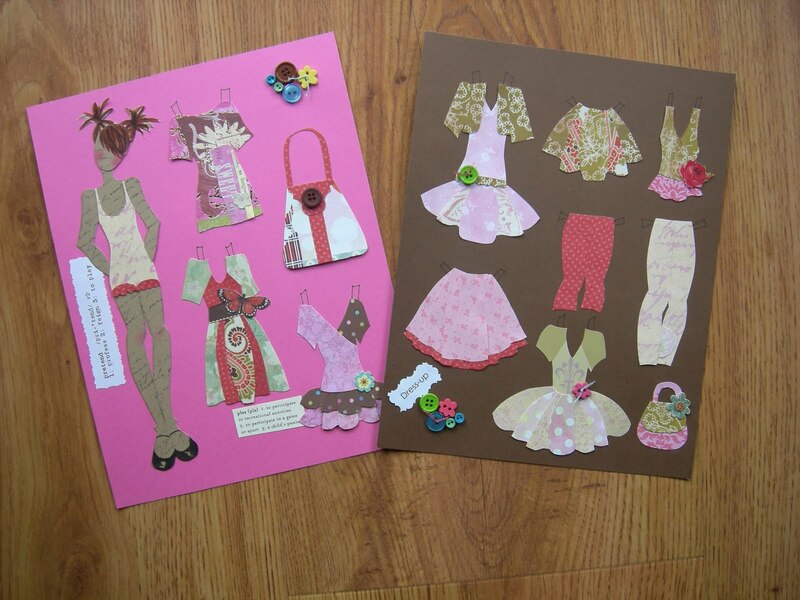 I've been making paper dolls and bookmarks for a craft fair next week. I need lots of inexpensive goodies for this show and lots of kid stuff. I will also be doing a hands-on collage demo during this show which will mostly be kids and their moms. Lots of fun! I was a major paper doll fan as a kid. I had Barbie of course, but also, Samantha from Bewitched, Ellie May from The Beverly Hillbilliies, That Girl and Haley Mills, just to name a few. I could spend hours cutting out the clothes and then designing and coloring my own to cut out. I suppose this is where it all began with me and my paper obsession. It was good training! I'm loving the pigs on the top doll...too cute! and the layered papers on the bottom page are absolutely darling. What a great obsession !